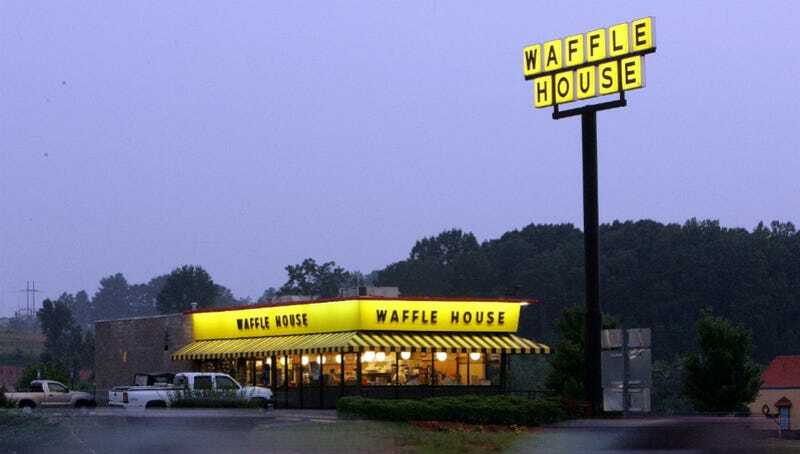 A waitress at a North Carolina Waffle House thought she had hit it big with an enormously generous customer, until she realized that her employers were soulless, joy-murdering monsters. Before anyone reads the headline, immediately thinks this was an unintentionally-large tip and tries to go off on this, slow your damn roll. It was entirely intentional. Also, doubters thinking she made it up: Josh Shaffer at the Raleigh News-Observer double-checked this story with the patron who left the tip and can confirm it actually happened. He paid his bill with a credit card and wrote $1,500 on the tip line, asking Brown to share $500 with a haggard-looking woman at a table nearby. It's worth noting that this was NOT someone affiliated with merry band of wonderfuls Tips For Jesus — this was just an incredibly nice dude who had plenty and wanted to share it with those in need. He specifically said "I am leaving this large amount, please take 2/3 for yourself and give 1/3 to that other nice person who looks like they could use a helping hand." Just your garden-variety entirely selfless act of charity. Great person, great story, right? Not so fast. Apparently, it's "standard policy" at Waffle House to decline any large credit card tips and ask the customer to pay by cash or check — but by that point, the customer had already walked out the door. The company says the rule is in place "in case the customer decides to dispute the tip later or ask for a refund." But to me, you don't put up roadblocks to charity. You don't make it hard for people to be nice, or they'll give up trying. And more than anything, you don't dump on your own people as a matter of policy...I'm guessing Brown's co-workers are wondering what'll happen the next time they get rewarded for a good deed. I'm also guessing that any of the Waffle House managers who made this call would feel differently if they'd had a bonus swiped from them. Fortunately, thanks to Shaffer, it has a happy ending: when the businessman he contacted said that he didn't have Brown's contact info (why would he? ), Shaffer gave it to him, and he immediately pledged to write her a personal check. Sadly, his attempt to help out the other customer won't go through purely thanks to Waffle House's dickishness, but at least part of his good deed will be accomplished. This story, meanwhile, comes to us one day after the premiere of Rachel Ray's new show, The Big Tip With Rachel Ray, where she seeks out awesome servers in need and surprises them with thousands of dollars. Sounds like a good plan, unless the restaurants where they work try to make the servers give the money back because they're as soulless and evil as the fuckers calling the shots at Waffle House. ETA: Numerous people have commented that apparently Rachel Ray loved to hose servers on a show she previously had. I was not aware of this, as I'd rather crack a cyanide capsule in my mouth than watch her if someone's not paying me, but you can rest assured that I'm now well aware and that you'll be seeing something for it.